For mature skin with redness and pigmentation problems. Skin cells are renewed every 28 days. Mirroring this same regenerative cycle, Intensive Treatment for Menopausal Skin should be used as skin care for 28 days. Intensive Treatment for Menopausal Skin works most effectively when used four times a year as a stimulus. Seems to leave skin feeling refreshed and more elastic. This Intensive Treatment is intended to complement your daily holistic skin care routine. 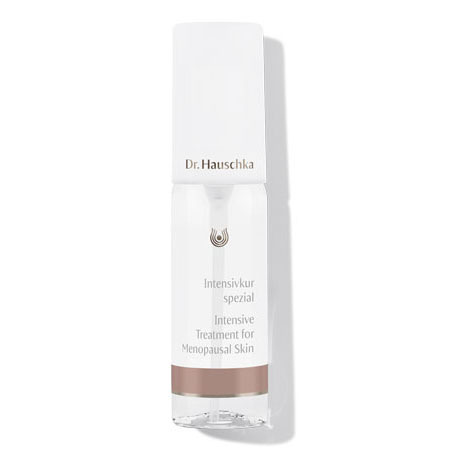 Continue to cleanse, tone and moisturize daily using Dr. Hauschka preparations such as Cleansing Cream, Regenerating Serum, Regenerating Day Cream, Regenerating Neck and Décolleté Cream and Regenerating Eye Cream. In addition, we recommend an intensive skin care routine once or twice a week with Clarifying Steam Bath, Clarifying Clay Mask and Firming Mask.